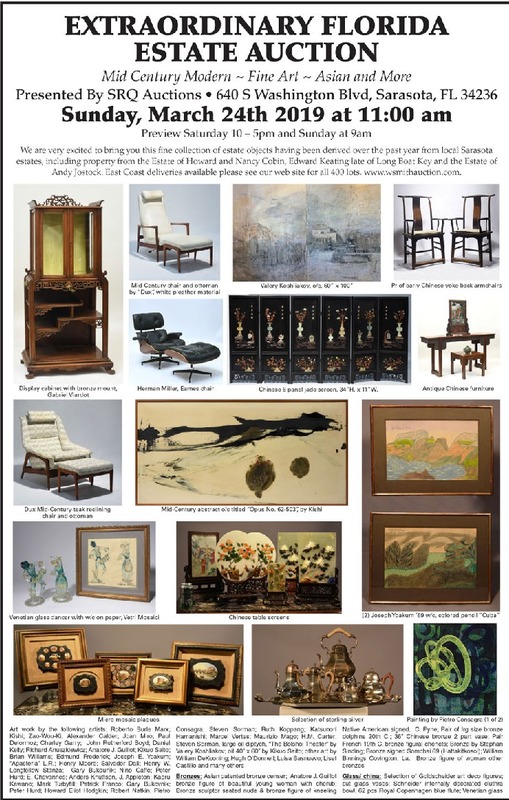 We are very excited to bring you this fine collection of estate objects having been derived over the past year from local Sarasota estates, including property from the Estate of Howard and Nancy Cobin, Edward Keating late of Long Boat Key and the Estate of Andy Jostock. East Coast deliveries available please see our web site for all 400 lots, www.wsmithauction.com. Chinese 6 panel jade screen, 34”H. x 11”W. 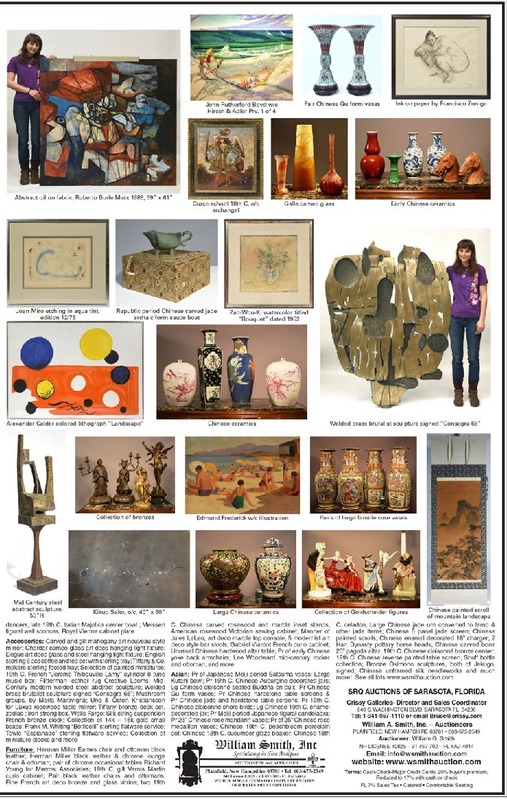 Asian: Pr of Japanese Meiji period Satsuma vases; Large Kutani bowl; Pr 19th C. Chinese Auburgine decorated jars; Lg Chinese cloisonné seated Buddha on bull; Pr Chinese Gu form vases; Pr Chinese hardstone table screens & Pr Chinese jade and hardstone table screens; Pr 19th C. Chinese cloisonné shore birds; Lg Chinese 19th C. enamel decorated jar; Pr Meiji period Japanese figural candelabra; Pr 26” Chinese rose mandarin vases; Pr of 25” Chinese rose medallion vases; Chinese 19th C. peachbloom porcelain pot; Chinese 18th C. cucumber glaze beaker; Chinese 18th C. celadon; Large Chinese jade urn converted to lamp & other jade items; Chinese 6 panel jade screen; Chinese painted scrolls; Chinese enamel decorated 18” charger; 2 Han Dynasty pottery horse heads; Chinese carved bone 20” pagoda altar; 19th C. Chinese cloisonné bronze censer; 19th C. Chinese reverse painted table screen; Snuff bottle collection; Bronze Okimono sculptures, both of Jakugo, signed; Chinese unframed silk needleworks and much more!